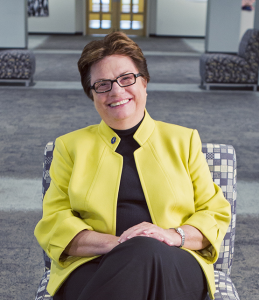 Dr. Maryanne Stevens, RSM, became president of College of Saint Mary on June 1, 1996. College of Saint Mary is the region’s only Catholic university for women. Dedicated to creating an environment to call forth potential and foster leadership, College of Saint Mary has developed several innovative programs under the leadership of Dr. Stevens, specifically: a special residence hall allowing college-age single mothers to live with their children on campus; innovative scholarships for undocumented students; and the development several high demand graduate programs. Dr. Stevens serves on several community boards and has made numerous presentations to local and national professional groups on women’s issues, the value of gender-specific education and the value of meaningful work. Dr. Stevens has a bachelor’s degree in math and sociology from College Misericordia in Dallas, Pennsylvania; a master’s degree in theology from St. Louis University; and a Ph.D. in religion and education from Boston College.